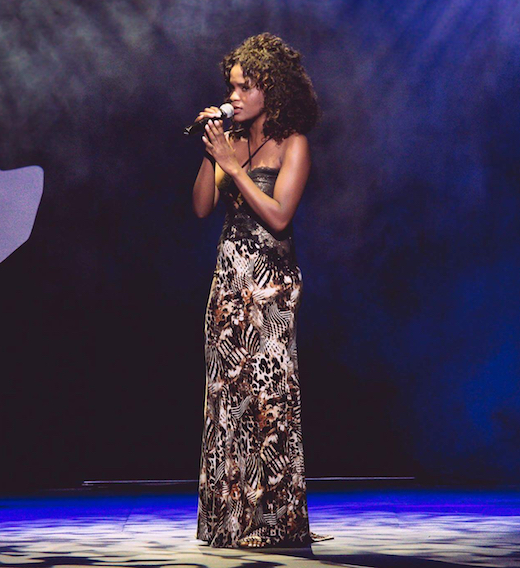 Stepping onto a stage for the first time in her life, Amanda Faku became an instant star and received the fastest four-chair-turn when she sang John Legend’s "Ordinary People". Growing up in a township called Ezinyoka in Port Elizabeth, Amanda sang in their house church where her father was a pastor. She was studying accounting at Nelson Mandela Metropolitan University when she found out about the auditions for the second season of The Voice SA. Being such a fan of the show and having missed auditions for the first season, she made sure she kept an eye on audition dates and as the saying goes, "the rest is history…"
We caught up with her recently for a chat. Amanda Faku (AF): "I like to spend time alone and I enjoy a good read." GO: At what age did your passion for music start, and how? AF: "I have always had an interest in music because I remember at age 6, that's when I realised I could actually sing. That was when my Mom told me to lead sing at our house church." GO: Being such a versatile singer, you are able to perform in various genres but continue to return to soul, jazz and R&B. What is it about those genres that makes them your favourite? AF: "Soulful R&B and Jazz music connect with me more as they usually have more meaning and depth. They also showcase my vocal skills a lot more." GO: If not for music, what career would you have chosen, and why? AF: "I don't think I'll ever choose a career besides music. I am a fulltime student studying towards a Diploma in Accounting. My end goal is to understand money more and the business side of music so I can have my own business in the music industry." GO: SA got to know and love you on Season 2 of The Voice SA. What were some of the highlights of the show for you? AF: "My number one highlight was finally finding the strength to believe in myself and go audition. I also grew as a musician and as a performer. Karen Zoid was the best coach, she has taught me that you work hard for your dreams and you don't wait on handouts. I also made great friends that I appreciate so much and my time on The Voice SA was a gift from God and I'm thankful." GO: Has being on the show opened any career doors for you? AF: "It has opened so many doors because I am now known by already established artists and I am currently working on projects with a few. I now perform and get paid, and before being on The Voice SA I had no prior experience on stage. On social media people know me for my singing and not just as Amanda Faku and that has always been a dream." GO: Do strangers still recognise you from the show? AF: "Yes, they do. I was in hospital for a relative last December and a nurse recognised me and I was shocked and happy." GO: Who have been the biggest inspirations in your musical career so far? AF: "Daniel Caesar, Sam Wills, Thandiswa Mazwai, Samthing Soweto and Brenda Fassie are some of my favourite artists." AF: "I love watching Documentaries on real life matters and taking myself out to dinner. I have always loved to take myself out to dates and movies alone, ever since I was 13 years old." GO: You've been using the Gigster online booking platform for a short while, how are you enjoying using our booking system as opposed to traditional booking agencies? AF: "The fact that I don't have to draw up an Invoice from scratch is so convenient, so I love that." GO: What does 2018 have in store for Amanda Faku? AF: "I will be releasing new music and I know people will love it because I've worked with one of the best producers in SA and we created magic, so please stay tuned and support local talent. I come from a small community in Port Elizabeth with no opportunities, where almost every child is using drugs. I know kids have dreams and hopes to succeed one day so I know I want to mostly succeed to prove that where you come from truly doesn't determine where you'll end up in life. When I began to believe in myself my whole life changed for the better." Amanda's goal in the music industry is to create timeless music and, with her incredible voice and her obsession with all music that has a touch of jazz, R&B and soul, we're convinced she will attain that goal and look forward to watching her star rise even higher. CLICK HERE TO BOOK AMANDA DIRECTLY FOR YOUR EVENT!